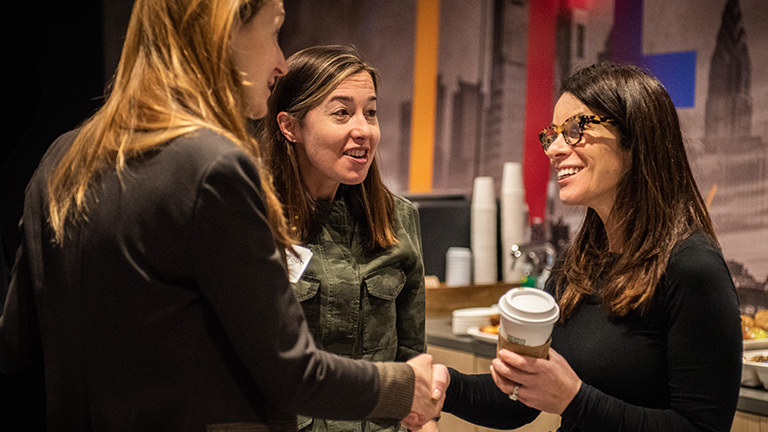 The LIVE@LIFT event held at LIFT Labs PHL in the Comcast Technology Center was presented alongside the Free Library of Philadelphia. In a fireside chat with Dan Gallagher, vice president of talent acceleration at Comcast, Keswin explained that great leaders embrace flexibility, check in regularly with employees, and never hide behind technology. Don’t hide behind technology. Communication is a crucial part of creating a more human workplace. But far too often, we rely on instant messaging or email when a face-to-face interaction would be more fruitful. Keswin’s advice? Don’t default to the technical option because it’s easiest. Instead, take a moment to think about the best the communication method for your interaction. “Match the message to the medium. It takes five seconds. Pause and say to yourself ‘what is the best way to communicate?’ ” said Keswin. That will lead to more face-to-face interactions — something we all need to succeed. “Getting up, walking down the hall, not bringing lunch back to our desks every day and building relationships – it’s all crucial because that is what’s going to move our careers forward,” she said. Get your company values “off the walls and into the halls.” Maybe your company values have stood for 100 years. Maybe you need a brainstorming session to figure out exactly what your organization stands for. Maybe you’re somewhere in the middle. In any case, determining what your company cares about is a solid first step. Actually living those values everyday sets great workplaces apart. Connect with employees in a real, honest way. Much has been written about how millennials and Gen Z want more purpose, meaning and connections at work. But Keswin argues that employees of all ages are looking for those things too — and strong leaders will take notice. Be intentionally flexible. Managers who are checking the time clock won’t retain top talent in today’s tight job market. We live in the gig economy where people can work anywhere, anytime. Employees are also have plenty of responsibilities outside the office — like caretaking for young children or elderly parents. It makes embracing flexible work arrangements critical. Forget the annual performance review. Do regular check-ins instead. Doing performance reviews once a year is a relic of the past. Today’s top employees want to constantly learn and improve — and regular check-ins really help that process.